To reduce the growing burden of water-borne diseases, infant deaths among other socio-economic crisis, especially in the Niger Delta region, experts are concerned about access to potable water. Specifically, the United Nations Children Fund has said that lack of access to potable water increases conflicts and agitation; reduces good hygiene and productivity. In view of this, the UN interventionist agency in partnership with the European Union (EU) is deploying environmentally-friendly technology, resources and expertise to reduce and gradually eliminate water-related diseases killing children in various states in the Niger Delta. The motive is to encourage governments to expand the systems to enable more Nigerians have sustainable access to sanitation and safe water. Recently, Akwa Ibom State, where access to clean water seems a mirage, became the focus of the agencies. 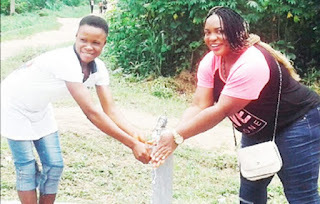 The Akwa Ibom State Government, UNICEF in collaboration with Federal Ministry of Information and EU recently, gathered journalists at Uyo, Akwa Ibom State, to examine challenges of lack of drinkable water in the state. The workshop on Water Sanitation and Hygiene (WASH) brought notable journalists in a roundtable to learn from experts and become part of the solutions to a mountain-like problem. Presenters were, Mr. Moustapha Niang, a ‘WASH specialist; Martha Hokonya, also a WASH specialist; Nse Edem, the Permanent Secretary, Akwa Ibom State Ministry of Political, Legislative Affairs and Water Resources; Edinyanga Pius Ukpong, Water, Sanitation and Hygiene Committee (WASHCOM) Chairman and Geoffrey Njoku, UNICEF Senior Communication Specialist among others. Diarrhea was identified as the third highest cause of death in children. Advantages of sanitation were discussed by the presenters. Clean procedures help to reduce morbidity and mortality; healthcare expenditure and poverty. It also increases productivity, school attendance and income generation opportunities. Martha Hokonya, in her presentation said access to water and proper sanitation could reduce poverty through decrease in morbidity, mortality, reduction in health expenditures, and so on. She said EU, UNICEF and the WASH Akwa Ibom, State, have been developing various innovative approaches to end water-related deaths in rural communities. She said UNICEF and its partners with effective knowledge management produced learning-based approaches and evidence-based advocacy and programmes to stop the menace in communities. Moustapha Niang, a ‘WASH specialist,’ in his presentation, ‘Water, supply and quality in the Niger Delta,’ emphasised on the need for proper orientation of the rural populace to adopt attitude change and embrace water safe plan from source, storage to point of use. Niang also recommended constant monitoring of water quality to detect contamination, while encouraging the establishment of a water sanitation committee in all communities across the region. “Prioritise the potential hazards and mitigate such hazards through the entire water chain to ensure that water reaching the consumer is safe and acceptable. Develop their community plan. Avoid for citing potable water source around nearby latrines and areas fertilized for agricultural purposes,” he stressed. To see the work done by all the interventionist agencies, journalists toured the three communities – Ikot Ikpene, Ikot Ukpong and Ikot-Esop in Nsit Atai Local Government Areas (LGA) of Akwa-Ibom State. They wanted to see whether the agencies were really walking their talk. The trip was to enable the participants see how safe drinking water and hygiene has improved lives of communities in Akwa-Ibom State. Edinyanga Pius Ukpong, Water, Sanitation and Hygiene Committee (WASHCOM) Chairman and his committee members commended UNICEF and EU for introducing them to a new hand washing technology. Ukpong told our correspondent: ““So, we use a rope and stick to construct a tippy tap. WASHCOM took us through hand washing facility training so that when people finish using the toilet they can wash their hands before going to their houses. The United Nations (UN) agency for children further said that poor Water, Sanitation and Hygiene (WASH) causes more than half of global diarrhea diseases. It explained that poor WASH remains the second leading cause of deaths and other health hazards among children under the age of five. The international agency noted that the chemical contaminations resulting from oil and gas exploration in the Niger Delta region has made it necessary for efforts to be made to ensure safe and constantly checked water for human consumption. UNICEF therefore tasked governments across the Niger Delta states to invest consciously in the provision of safe water supply and sanitation for its rural populace. The provision of such basic social amenity, according to UNICEF would encourage hand washing and other hygienic practices among school-age children and rural populace. UNICEF said, “Poor WASH causes more than half of global diarrheal diseases, which remains the second leading cause of morbidity and mortality among children under the age of five. “WASH also contributes to other goals including Nutrition (stunting) and maternal and new born health. “It improves productivity – by lessening the time spent by women and children to fetch water, reducing stunting and school attendance and performance especially by girls.